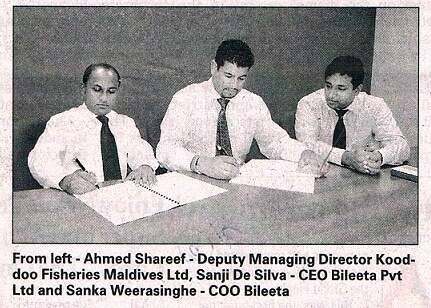 Bileeta Pvt Ltd, fresh from numerous local successes, has secured a contract to implement an ERP solution for Kooddoo Fisheries Maldives Ltd (KFML). The newly incorporated company has its main operation base in the former Kooddoo Fisheries Complex. This company has become the main player in the skip-jack tuna operations of the country, the Sri Lankan firm said in a media statement. “This is a huge business win for us as well a great achievement for a Sri Lankan company” noted Sanji De Silva, CEO of Bileeta. “We bid for this international tender and was selected from amongst many regional players thereby proving our capabilities of turning out world class ERP solutions for clients on medium to enterprise scale”. He said Bileeta was selected because of t he “unparalleled features” of the solution on offer including solid data security systems and the team of application consultants who impressed the Kooddoos decision makes with their knowledge and efficiency. “Because this ERP solution is designed and developed by us, we could also offer Kooddoos with custom features to closely meet their requirements to overcome the pain points that they were currently facing” said Sanka Weerasinghe, COO of Bileeta. The Kooddoo processing centre has a land based freezing capacity of 450 MT/day with 2000 MT storage capacity together with a fleet of mother and collector vessels. Furthermore, an alongside berth can accommodate a large number of vessels making KFML the top firm in collection and processing of Skipjack tune countrywide. The company is also engaged in the operation and management of ice plants located across the Maldives islands along with a water bottling operation based in the processing centre. Ahmed Shareef, Deputy Managing Director of Koodoo Fisheries Maldives Ltd said Bileeta was selected because of its capability of customizing and ERP solution that fits their requirement. The Bileeta team is headed by its CEO and founder Sanji De Silva who is experienced in IT solution design and development in Sri Lanka and the US. The chief architect and co-founder is Sanka Weerasinghe who has over 12 years of experience in product development and architecting ERP solutions.